A number of Parties to the Basel Convention have expressed concern with regard to abandoned ships on land or in ports and their potential effects on human health and the environment. Consequently, this issue was considered by meetings of the Conference of the Parties and the Open-ended Working Group. The issue was first raised at the seventh meeting of the Conference of the Parties in October 2004, at which time Parties were invited to provide further information regarding the abandonment of ships on land or in ports to the Secretariat (decision VII/27). The Secretariat was also requested to consult the International Maritime Organization (IMO) on this issue. In response, the Secretariat of the IMO produced a note providing information on the various IMO legal instruments and guidelines relating to the abandonment of ships. Relevant IMO conventions which may address this issue are the Convention on the Prevention of Marine Pollution by Dumping of Wastes and Other Matter (the London Convention) 1972 and the Nairobi International Convention on the Removal of Wrecks 2007, which has yet to enter into force. This issue was once again considered at the fourth session of the Open-ended Working Group in July 2005 at which time a questionnaire regarding the abandonment of ships was developed to extract information of interest from Parties (decision OEWG-IV/6). Information received pursuant to decisions VII/27 and OEWG-IV/6 was subsequently submitted to OEWG 5 for information purposes as documents UNEP/CHW/OEWG/5/INF/5 and UNEP/CHW/OEWG/5/INF/5/Add.1. The eighth meeting of the Conference of the Parties once again took up the matter of abandoned ships on land or in ports and in its decision VIII/13, recognised the need for guidance on how best to deal with ships that are abandoned on land or in ports, and accordingly, requested Parties to contribute to such guidance, in particular by submitting information on best practice examples from their national experience to the Secretariat. Further to decision VIII/13, OEWG 6 developed and annexed to its decision OEWG-VI/17 an information note entitled "Guidance on dealing with abandonment of ships on land or ports" and invited Parties and others to supplement the information, as appropriate. 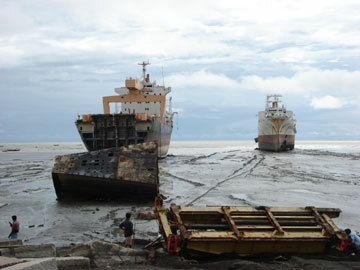 The information note, inter-alia, noted the relevance of the Nairobi International Convention on the Removal of Wrecks 2007 to some cases of abandoned ships. To date, further information on the abandonment of ships on land or in ports has not been received by the Secretariat.